After hearing arguments four months ago, this morning, the Supreme Court ruled on Whole Woman's Health v. Hellerstedt, striking down Texas' H.B.2 abortion restriction law. The court's first major decision on abortion rights in two decades means more than just the end of H.B. 2, which would have closed more than half of Texas' abortion clinics by forcing them to adhere to unnecessary standards. 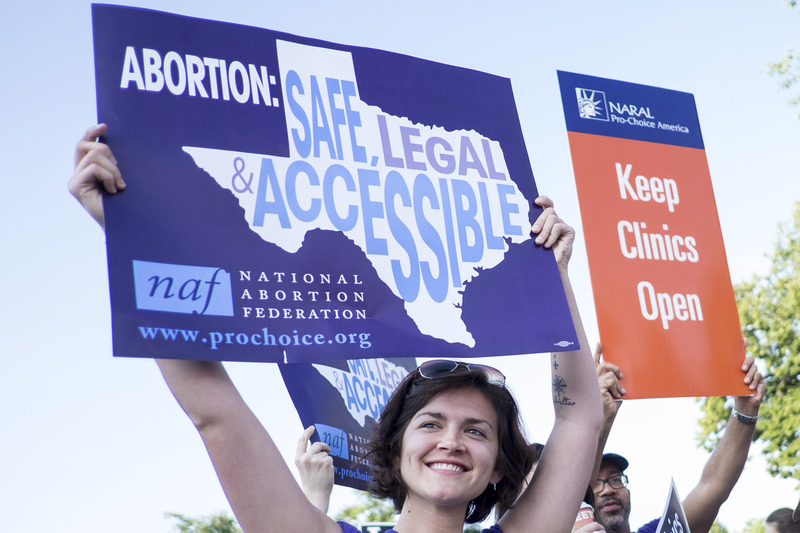 Countless women in Texas will have greater access to abortion care. And similar laws all over the country — which are designed to run abortion clinics out of business by making them meet expensive and arbitrary requirements — could also soon be on the chopping block. The decision was an unexpected win for the reproductive rights community, which spent the past few months preparing for all possible outcomes, including the court upholding the law. So it is not surprising that the reactions on social media this morning have been pretty jubilant. Whole Woman's Health themselves shared their reactions online, both in a formal statement and in some video footage of staff members toasting the victory for reproductive rights. This was a decision that had reproductive rights advocates and activists all over the country twisted in knots, so there's been a lot of celebrating.